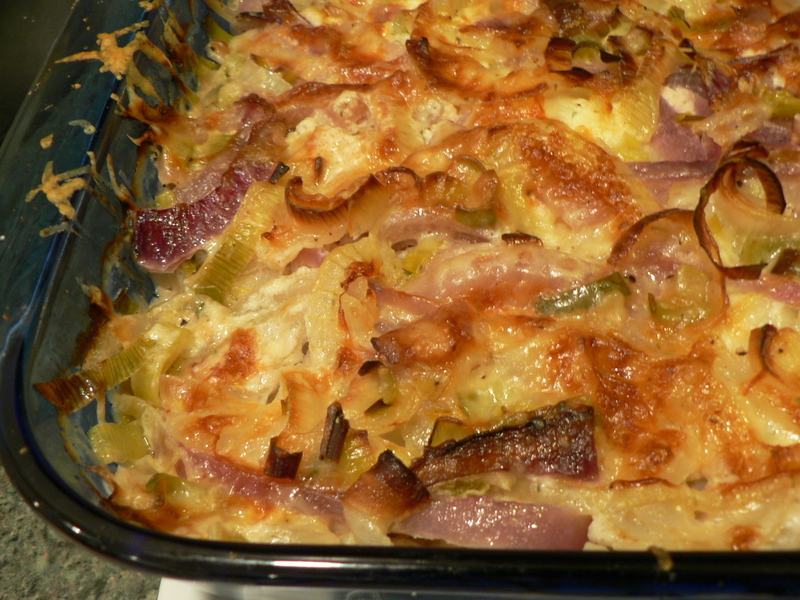 Three onion casserole fresh from the oven. We decided to spend both Christmas and New Year’s weekends at home this year. We’d traveled for Thanksgiving and that was enough for us. On top of the two long weekends, I also had two personal days at work that I needed to use before the end of the year – so I ended up with two 4-day weekends in a row. For someone who loves to cook, this was pure luxury! Definitely not an opportunity to be wasted – and I tried not to, as I will try to recap in the next couple of posts. In the spirit of taking a festive approach to this opportunity, I sat down with one of my most appropriately festive cookbooks: The Silver Palate Good Times Cookbook. Doesn’t the name just say it all? This book does not contain heart- or waistline-friendly recipes. But how often do you have an excuse to cook really decadent party food? (As opposed to a beautiful-yet-healthy potluck dish, for example?) For those rare times when you do – this book does not disappoint. And indeed, it was not long before I was mentally bookmarking various ideas, but I finally found the one. The one I could not imagine NOT making for a long holiday weekend. 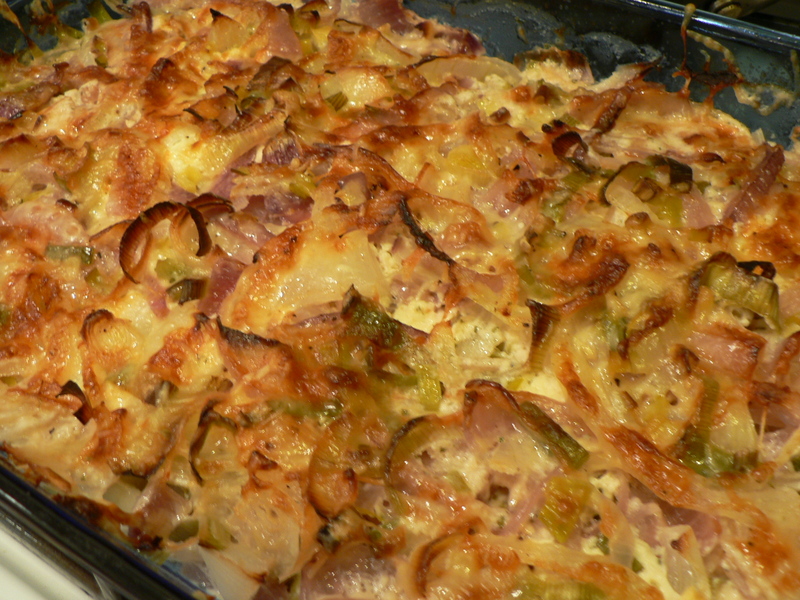 It had the simple name of Three-Onion Casserole and was billed as an ‘accompaniment.’ But don’t be fooled: this dish’s size (it filled a 9×13″ pan above the brim), cost (almost $50 worth of ingredients, most of them various kinds of cheese) and flavor (wine, garlicky boursin, herb-flecked dill Havarti, and slow-roasted leeks and onions topped off with crusty, deliciously browned Gruyere) are no side show. If you were to bring this beautiful, fragrant and filling casserole to a winter party, your brilliance and generosity would not soon be forgotten. I didn’t; I just made it for the two of us, for New Year’s weekend. One more note about this dish: it is labor-intensive, perhaps only suited for one of those 3- or 4-day weekends when cold weather has you trapped indoors anyway. There is simply no way to make light work of slicing this many onions, nor do Havarti or Gruyere typically come pre-grated. Just hang in there and get it done; you will be richly rewarded. It may seem completely inconceivable, but Tomas and I ate this whole casserole by ourselves. Eventually. I think it took about a week… but boy, those leftovers made for the best lunches ever. Like extending the holidays right into the work week. Preheat oven to 350 degrees. Butter a 9×13″ baking dish with 1 Tbsp of the butter. Layer a third of each of the onions in the bottom of the dish and season with salt and pepper. Top with the grated Havarti. Create another layer of onions, seasoning again with salt and pepper. Top this layer with the crumbled Boursin, distributing it as evenly as possible. 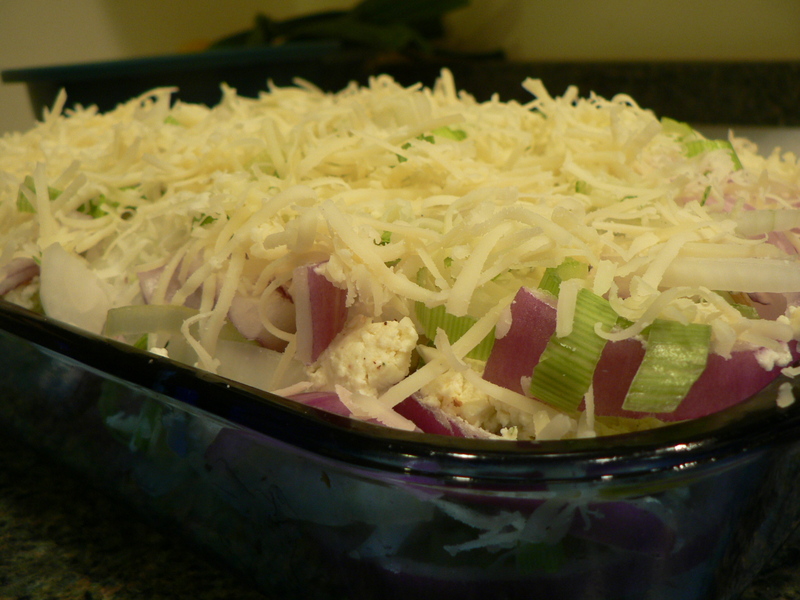 Layer the last third of the onions and leeks on top and top with the grated Gruyere. Dot the remaining 2 Tbsp of butter on top and pour the white wine over all. Bake for 1 hour, covering the dish with aluminum foil after 30-45 minutes or when it is sufficiently browned to prevent the top from burning. Serve immediately (but makes fabulous leftovers). The Silver Palate cookbook says that this makes 6 servings, but perhaps that was in 1985. I would argue that it could easily feed 12 people if they help themselves to fairly generous portions. This would be a great side dish for any kind of steak or filet, but I enjoyed it with brussel sprouts, good bread and sweet potatoes.